We’ve worked with Margate-based design duo, Crispin Finn, to produce our Summer window design on the theme of ‘stationery’. We’re delighted to say that to coincide with their specially designed summer window display at Frank they have also made a new gift wrap and a three colour screen print edition which reflect their love of stationery and utilise their signature colours. The print is available online and in store now. 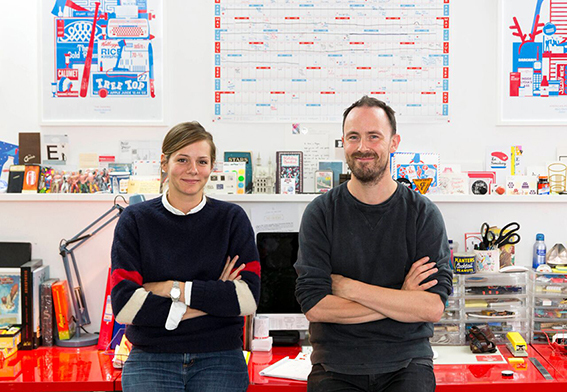 Crispin Finn is two person design duo Anna Fidalgo and Roger Kelly who have worked together since 2007. Both studied in London at Chelsea college of Art, where Anna studied Graphic Design and Roger Fine Art Painting. Their collaboration began by hand making a large format Year Planner for personal use after being unable to source one that was both practical and bearable to look at for a whole year. Since then they have worked with a diverse range of clients on a variety of commissions and projects, as well as making their own ranges of stationery, household goods and prints, and exhibited widely in the UK and abroad. Screen printing is a primary source of production for their own work, and they currently have a print studio in Margate, Kent where they make and package their own wares. Much of their personal work appear in the colours red, white and blue, a colourway that was chosen at the beginning of their partnership as a way of being able to experiment with good quality screen print ink economically by only requiring three colours at any time. They both loved the combination of colours and its use on stationery and ephemera from across the 20th century.